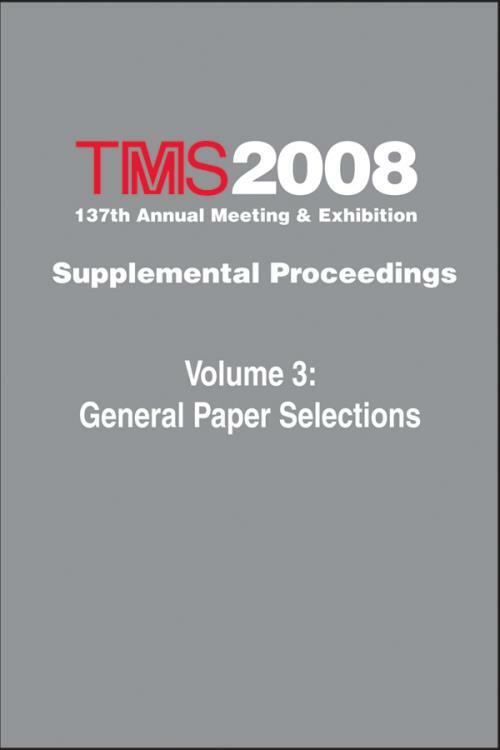 This volume contains a collection of papers from 10 general–topic symposia held at the TMS 2008 Annual Meeting & Exhibition in New Orleans, Louisiana, March 9–13, 2008. Papers included deal with materials processing and manufacturing; structural materials; light metals; and electronic, magnetic and photonic materials. Supplemental Proceedings: Volume 3: General Paper Selections. General Abstracts: Materials Processing and Manufacturing Division. Austenite Grain Refining of As–Cast Bloom Surface by Reduction of Oscillation Mark Depth (Y. Ohba, S. Kitade, and I. Takasu). Quality Assessment of Casting Filling Method (M. Jolly, and C. Reilly). Phase Field Simulation of Irregular Eutectic Solidification (R. Zhang, M. Li, and J. Allison). A Numerical Scheme for Solving Microsegregation for Solidifying Metallic Alloys (S. Uddin, and M. Hasan). Advances in NDT Techniques for Friction Stir Welding Joints of AA2024 (T. Santos, P. Vilaça, L. Reis, L. Quintino, and M. de Freitas). A Thermal Model of Friction Stir Welding Applied to Aluminum 7136–T76511 Extrusions (C. Hamilton, S. Dymek, M. Blicharski, and I. Kalemba). Effect of Ultrasonic Vibration on Solidification Structure of TCS Stainless Steel (J. Liang, L. Wang, C. Song, L. Liu, and Q. Zhai). Effect of Tin Content on the Magnetic Properties and Recrystallization Behaviors of Grain–Oriented Electrical Steels (C. Liao, and C. Hou). Mechanical Properties and Microstructure of Friction Stir Welded High–Strength Automotive Steel (M. Miles, E. Olsen, T. Nelson, and M. Gallagher). Integrated Fabrication of Functionally Graded Ti3SiC2–TiC Binary Phase Rod by Traveling Zone Sintering Method (S. Tada, and K. Kobayashi). Study on Deformation of Large–Scale Hydraulic Turbine Blade during the Casting Process (J. Zhang, J. Kang, Y. Wu, J. Zhang, Z. Rong, C. Zhang, and B. Liu). Multi–Temperature Uniaxial Compression Testing of Sintered ZrN and (Zr,Ti)N Pellets as Surrogates for PuN and (Pu,Zr)N Fuels (K. Wheeler, P. Peralta, and K. McClellan). A Nano–Indentation Study of Surface Plasticity in Zirconium Nitride (K. Wheeler, P. Peralta, G. Egeland, and K. McClellan). Influence of High–Intensity Ultrasonic Treatment on the Phase Morphology of Mg–9.0wt.%Al Binary Alloy (Z. Zhang, Q. Le, S. Guo, and J. Cu). Effect of Electric Current Pulse on Solidification Structure of Bearing Steel with Low Voltage and High Discharging Frequency (J. Li, Y. Gao, J. Ma, and Q. Zhai). A Calculation Model for Thermal Performance during Particle Cooling in the Substate–Coatings System Based on Plasma Spraying Processes (L. Niu, T. Zhang, J. He, and Z. Dou). Optimization of Gas Carburizing Process in Batch Furnaces with Endothermic Carburizing Atmosphere (O. Karabelchtchikova, and R. Sission Jr.). Experimental and Numerical Study of Flame Load Heat Transfer in an Experimental Furnace (A. Kumar, R. Venuturmilli, L. Kiss, and G. Walter). Influence of the Process Parameters on the Multi–Directional Forging Operation of a Two Cylinder Crankshaft (S. Mueller, P. Lau, and R. Nickel). Controlled Sheet Metal Straightening (B. Behrens, and R. Krimm). Drilling and Milling of Intermetallic ?–TiAl (D. Biermann, and S. Bergmann). Preparation of High–Purity Strontium Carbonate from Celestite Concentrate by Double Decomposition–Roasting Process (M. Liu, T. Jiang, and G. Li). General Abstracts: Structural Materials Division. Blocking and Self–Locking of Superdislocations in Intermetallics (B. Greenberg, M. Ivanov, and A. Patselov). Effect of the ?/?′ Lattice Mismatch on the Creep Behaviour at 760°C of New Generation Single Crystal Superalloys (P. Caron, and F. Diologent). Oxidation Behavior of Mo–Si–B Alloys Produced by Reaction Synthesis (M. Middlemas, and J. Cochran). Pile–up/Sink–in in Nanoindentation Rate Sensitive Creeping Solids (A. Elmustafa). Researches Concerning the Structural Characterization of Hybrid Composite Materials (P. Moldovan, G. Popescu, C. Popescu, and B. Ghiban). Quantitative Evaluation of Creep Curve of Alloy–Type and Metal–Type Creep in Magnesium–Aluminum Binary Alloys at Around 0.6Tm (H. Sato). Properties of Titanium Oxide Films Deposited by the Sol–Gel (P. Favilla, M. Alterach, M. Rosenberger, A. Ares, C. Schvezov, and O. Amerio). Microstructural and Mechanical Properties of Alumina Coatings Produced by Microarc Oxidation Technique on 7039 Aluminum Alloy Substrate (A. Polat, J. Baxi, Y. Kar, M. Usta, M. Makaraci, H. Liang, and A. Ucisik). Effects of Lattice Defects Induced by Hydrogen and Stress on Environmental Degradation of Metals (K. Takai, and H. Shoda). Brittle Crack Susceptibility of Low Temperature Separator Vessel Material (A. Nawaz). Direct Production of Super–Grade Materials in Nano–Particle Based Fuels (L. Popa–Simil, and C. Muntele). Synthesis and Microstructure of Si3N4–TiN nanocomposites (M. Yang, M. Lv, and H. Zhu). Austenite Grain Stability of Low–Manganese, High–Chromium Carburizing Steel (T. Fujimatsu, K. Hashimoto, S. Fukumoto, and A. Yamamoto). Development of High Strength Non–Oriented Electrical Steels (H. Park, S. Chang, and B. De Cooman). Characteristics of Hybrid Solid Solution Layer Formed on the Surface of 316 L Austenitic Stainless Steels (O. Celik, H. Cimenoglu, and E. Kayali). Microstructure Evolution in Nano/Sub–Micron AISI 301 Stainless Steel (S. Rajasekhara, P. Ferreira, L. Karjalainen, and A. Kyröläinen). Effects of Mo and Ni on Textures and Magnetic Properties in 3%Si Non–Oriented Electrical Steels (S. Chang). General Abstracts: Light Metals Division. An Optimization Study for an Efficient Hydrogen Removal during Twin Roll Casting (A. Dursun, B. Çorlu, M. Dündar, and R. Erdogan). Methods of Manganese Alloying to Aluminum and Their Impact on Melt Quality (V. Ohm, and R. Bauer). Manufacture and Characterization of Al–3Mg–Nb (N. Lopez, X. Rodríguez, S. Dominguez, L. Vazquez, V. Cortés, M. Domínguez, G. Lara, M. Vite, J. Aguilar, and S. Buenavista). An Investigation of Hexavalent–Free Chromate Conversion Coatings for Test and Measurement Instrumentation (M. Powers). Fabrication of AA2024–SiC Nanocrystalline Metal Matrix Composite (T.Z. Lin, C. Tan, B. Liu, Q. Yang, and A. McDonald). Concentrations on the Corrosion Susceptibility of Al – 1.0%Zn Alloy in Acidified Vernonia Amegdalina, Pipernigrum and Telferia Occidentalis (N. Idenyi, C. Ekuma, and S. Neife). The Impact of Corrosion on the Deformation Behaviour of Al–Zn Alloys in 0.1M HCl and Seawater (N. Idenyi, I. Owate, C. Okeke, and S. Neife). Effects of Different Annealing Processes on Microstructural Features of Twin Roll Cast 3003 and 8006 Aluminum Alloys (B. Çorlu, A. Dursun, M. Dündar, and C. Inel). Prefabricated Materials Preforms in Titanium Alloys using Stationary Shoulder Friction Stir Welding (P. Threadgill, B. Wynne, M. Russell, and P. Davies). Bonding of Steel Inserts during Aluminum Casting (Q. Han, S. Viswanathan, K. More, M. Myers, M. Warwick, and Y. Chen). Low Temperature Electrochemical Synthesis of Ti–Al Alloys Using Ionic Liquid Electrolytes (D. Pradhan, and R.G. Reddy). Residual Life Extension of Aged Transformers in Aluminium Smelters (S.K. Rajamoorthy, and S. Krishnamoorthy). Revamping of Rodding Shop Worldwide (J. Grunspan). Electrical Conductivity of Molten Electrolytes for Light Metal Production (A.A. Redkin, O.Y. Tkacheva, and A. P. Shuryghin). General Abstracts: Electronic, Magnetic, and Photonic Materials Division. Studies on ZnO Based Diluted Magnetic Semiconductors (S. Deka, and P.A. Joy). Tantalum Electrlytic Capacitors (R.A.R. Rashid, S. Jyoth, Rajkiran, and P. Goud). Experimental Study of Co–Deposition of SiO2 and GeO2 in a Modified Chemical Vapor Deposition (MCVD) Reactor (S. Zhan, M. Hasan, T. Wang, and Z. Chen). Lightning Causes and Effects – A Systematic Protection Approach for the Aluminum Industry (F. D′Alessandro). Magneto–Optical Study of Cobalt Ferrite Nanoparticles (B.L. Scott, C. Radu, D.A. Smith, and K.L. Stokes). Application of Amide Impregnated Fiber to Separation of Precious Metals (H. Narita, M. Tanaka, K. Morisaku, K. Tamura, D. Sakamoto, M. Suzuki, and T. Nadano). Effect of Cr on the Oxidation Behavior of Ti–46Al–2V Alloy (D. Pilone, and F. Felli). Elastic–Plastic Stress and Deformation Analysis of Annular Plates under Prescribed Radial Loading (A.H. Elkholy, and A.H. Falah). Inoculation of Aluminum Alloys with Nanosized Borides and Microstructure Analysis (H.E. Calderón, C. Smith, O. Menéndez, and O.M. Suárez). Microstructural Characterization in Cast AlMg Alloy–SiCp Composites (A. García, and S. Valdez).